As most people spend between a third and a half of their lives in bed, it is important to ensure that the time spent there is as comfortable as possible, and that it is easy to move around or get in or out of the bed. For information about choosing a standard, extra long or extra wide bed, contact the National Bed Federation (NBF). They will be able to send you factsheets on how to choose a bed and mattress. These are provided free of charge. The aim of this factsheet is to provide information about accessories for standard beds and beds with special features that are available to help people with specific difficulties or their carers. These difficulties may include getting in and out of bed, turning over, sitting up and generally getting comfortable in bed. Comfort and sleeping well are essential not only for the well-being of a person, but also because, for some people, they may mean the difference between being able or unable to carry out activities independently. If you are experiencing difficulty with any of the activities mentioned above, you may benefit from an assessment by a physiotherapist or occupational therapist. Sometimes a change in the way you carry out an activity or a different technique may help you to manage independently instead of using equipment. Many of the beds with special features are available as a double bed where one side of the bed remains as a standard bed. For up-to-date product and supplier information, please contact our equipment helpline, open Tuesday to Thursday 10am-4.30pm. Tel: 0300 999 0004 (calls charged at local rate) or if phoning from a mobile, it is cheaper to ring 020 7432 8018. Alternatively, you can write to us at 34 Chatfield Road, Wandsworth, London SW11 3SE or contact us via email at advice@dlf.org.uk. To help us give you a concise and informative reply, please provide us with as much detail as possible including information on the difficulties you are having and any solutions you have considered, such as equipment ideas. All upholstered furniture that is intended for private use in a house needs to conform to the Furniture and Furnishings (Fire)(Safety) Regulations act 1988. Within each standard there are several parts with tests of increasing severity. Check with suppliers which parts have been met. It is advisable to seek independent advice before buying bed accessories or buying a special bed. Sometimes another solution may help instead, or the local council or health service may provide an appropriate service. Beware of salesmen who try to persuade you to buy equipment that does not meet your needs or is poor value for money. If you have a disability or you are caring for someone with a disability, remember that you have the right to ask social services for a community care assessment. The council assessor considers the type and level of your need. If you have many needs or if your needs are assessed as essential or complex the council may help directly; for example, if you have difficulty moving in bed and getting out of bed. If you find you would prefer a different service to the one offered by the council you can ask for a direct payment of money instead; since April 2003, this also applies to equipment the council may offer you. If your needs are few or simple, the council may not help directly. For example, if your only need is that your bed is too low which makes it difficult for you to stand up, you may receive advice on alternative ways of solving the problem instead of direct help. Perhaps you may be directed to where you can buy equipment locally, visit a local independent living centre or obtain suitable mail order catalogues. The recommendation is that before you buy any equipment, particularly beds, try it out. In the past this was often seen by the different authorities as a grey area of provision. Even today, the organisation that provides this type of equipment may vary from one area of the country to another. hoists and small handling equipment. However, other items are regarded as daily living equipment, i.e. that which enables a person to get on with daily living, and may make them more independent. This type of equipment may be supplied by social services. The different authorities now have a legal duty to work together to try and ensure equipment is provided as quickly as possible after an assessment of need is agreed. Lifting poles (or pull handles) are designed to make moving around, moving into semi-lying positions or getting in and out of bed easier. The majority have a floor standing cantilever gantry, although some are wall- or bed-attached. If freestanding, care should be taken to ensure that the base is positioned properly under the bed, otherwise the gantry frame may tip over. A handle hangs from the gantry and, when adjusted to a suitable height, some people with enough strength can pull on it safely. The user does need to have fairly strong upper limbs and good abdominal control. Lifting poles are not usually suitable for people with painful arms, painful shoulders, limited overhead shoulder movement or abdominal weakness. Rope ladders either fit onto the footboard, the bed frame or the two feet at the end of the bed. They have rungs which the person pulls on to help him/herself into a sitting position. Ensure that the ladder is safely and securely fixed in place and that the first rung is within reach of the person lying on the bed. Take care as those with plastic rungs may be slippery to hold. A retrieval line pinned to the bedclothes is sometimes needed if the rope ladder slips to the floor during the night. A pull strap has a similar function to a rope ladder; instead of rungs to pull on there are loops in the strap. Some straps have a clip that makes it easier to secure the strap to the bed. They are lightweight and easily transported. The various types of grab handles on the market are either wall-fixed, bed-fixed or floor-fixed. They are used to pull on by someone to help sit up or turn over in bed. Some are fixed in one position, whilst others lock into a choice of several positions. Some of the static models could obstruct part of the bedside, making it difficult to get in and out. Floor-fixed rails may be difficult to install if the floor is made of concrete. Ensure that bed-attached models are securely fixed. Some are tucked under the mattress and only rely on the weight of the person to secure them in position. 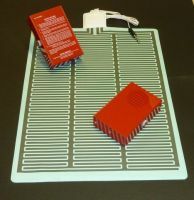 Mattress inclinators (or mattress variators) are powered devices which can help a person sit up and lie down independently. They can remain raised to form a backrest if required to support a person in a sitting position. They are available for single or double beds. mattress inclinators and pillow lifters usually lift the person forwards and away from the bedside cabinet. A few models are designed to slide back as they lift so that the cabinet is still in reach. Pillow lifters (or pillow lifts) rest on the top of the mattress and under the pillow (sometimes the pillow is part of the equipment). They are similar to mattress inclinators but are much narrower and give less support. If there is a risk that the person may fall off sideways it is probably more appropriate to use a mattress inclinator or a variable posture bed. Pillow lifters with a knee break reduce the risk that the person will slip down the bed. Variable posture beds have sections in the base under the mattress. The sections can hinge to form a back raise and sometimes a leg raise as well. This feature is known as profiling. Some companies have a double bed option. Usually this comprises two single beds placed close together (one or both with the profiling option). If needed, ensure the beds will separate easily, e.g. for carers to assist from both sides, and/or there is sufficient clearance underneath, e.g. for the legs of a portable hoist. two-section beds are sit-up only; the angle of the head section is adjusted to help sitting up/lying down or to form a backrest. There is no knee break option and, like most mattress inclinators and pillow lifters, it is likely that the person will slip down the bed. manually operated beds are controlled by a foot-operated gas-assisted mechanism, a lever or winding mechanism or a ratchet system. The carer can find all of these quite hard work and the user cannot control the adjustment. Both domestic and hospital versions of variable posture beds are available. The domestic ones tend to be smaller with a wooden or padded headboard and generally look more homely. The hospital versions are larger, usually with a metal frame, more resilient and often have a choice of nursing functions. It is important to check that a hospital bed provides the functions needed. Many have a tilting mechanism and most have the option of safety sides. It is necessary to specify other options; e.g. quick release of the backrest for resuscitation, removable head and footboards for assisted transfers, or the facility to choose which bed movements the occupant is able to control. These can be fitted onto the frame of a standard bed so that the platform can profile the mattress like a variable posture bed. The powered mechanism is controlled by a handset. These can be used either as a bed or chair and users do not have to transfer from chair to bed or vice versa if they need to change position or sleep. Some take the form of very adjustable beds, which can be electrically profiled so that the person is able to achieve a sitting position. Others are primarily chairs that can be reclined fully so that the person can lie horizontally. Some of the items below are occasionally used in conjunction with those in the following section - ‘For people who slide down the bed’- to prevent the person from sliding down the bed when in a seated position. These are used inverted on the bed to support the person’s shoulders, arms and neck. These have a wooden or metal frame. 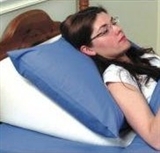 The angle of the supporting surface can be adjusted for use under the pillows to support the person in a sitting position. A headboard is essential to prevent the backrest from sliding backwards. Most fold flat for storage. Tilting headboards are pulled forward at the base to provide a backrest. They are found on many older hospital beds. The manual operation is often hazardous involving twisting, bending and straining. 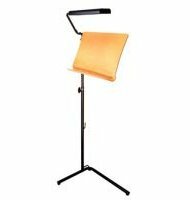 These supports are usually made of covered foam and have a backrest and armrests to provide comfort and support. These can be adjusted to change the shape or profile of the bed according to the needs of the individual. The head end of the mattress can be elevated to support the back and shoulders of a person whilst they are sitting, and a knee break stops users from sliding down the bed. For further information see section ‘For people who need help to sit up or lie down in bed’. The following items may help to provide a stable position for someone in bed. A person is more likely to slip down the bed when in a sitting position if they are not supported under their knees. Care should be taken that frequent sliding does not result in pressure ulcers. These are foam wedges or shaped pillows that can be positioned under the legs to provide support in bed. A footboard is attached to the mattress or to a fixing plate at the end of the bed. Users need to have enough strength in their legs to push against it to prevent them from sliding down the bed or to enable them to re-position themselves. These are slip-resistant devices that move in one direction only. They are made of a length of material that has been stitched to form a continuous roller. The inside of the glide is made of a material that will easily slide one way, but cannot slide the other way. It is placed under the person sitting in bed, and enables him/her to slide or be slid backwards into a stable position, but not to slide forwards again. Some have foam or gel cushion inserts for comfort. Some sliding sheets can also be used in a similar way. Care should be taken to ensure that the material does not wrinkle up under the bottom of the user, as any creases could be uncomfortable and potentially lead to pressure ulcers. Kings Fund beds are used mainly in hospitals although, on rare occasions, they are provided as nursing equipment in a domestic environment if space permits. Hospital beds are heavy and the risks of delivering and installing the bed will prohibit use in many situations. To help prevent the occupant from sliding down either in a sitting or lying position the bed can be angled backwards by 3° or 4°. Making this adjustment can be very hazardous, as the foot end of the bed needs to be lifted and lowered manually. It is preferable to use a bed with an electrically controlled tilting facility or a variable posture bed with a knee break. Some domestic-type beds have these features. These consist of a reinforced strap with a loop on the end. The person hooks his/her leg through the loop and then physically lifts the loop up onto the bed. However, the person concerned must have the strength, dexterity and the sitting balance to carry out the task. Some people use the crook neck of a walking stick or a looped webbing strap to perform the same task. 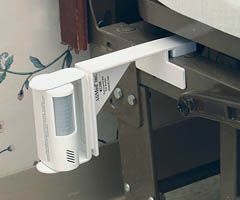 These are powered devices that attach to the bed frame and require the user to sit on the edge of the bed with his/her feet on the floor in front of the device. They work on the principle of a platform that raises through an arc of 90°, lifting the legs of the user to a position just beyond the horizontal, level with the mattress. From this position the user can slide his/her legs off the platform and onto the bed. Some use a compressor to fill an air sack which, as it inflates, raises the platform. However, many of these compressors make a noise like a vacuum cleaner and may be disturbing. Both types are controlled by a handset, which either has two separate switches or a rocker switch. Most people need to move or turn regularly in bed, either just for comfort or to prevent pressure ulcers from forming. Some people may find that the use of slippery nightwear or bedding such as satin pyjamas or sheets, combined with pulling on strategically placed grab rails or handles, may help them turn over or be assisted to turn over more easily. These can be used, with or without a pressure relief mattress, to reposition the user so that he/she may not have to be turned. By altering the profile of the bed the position of the user and weight distribution will be changed. This may be sufficient to prevent pressure ulcers from forming. If the backrest is in a semi-reclined position, the person may be able to pull on a lifting pole and roll onto one side or the other independently to relieve buttock pressure. Alternatively, this could be done by bridging, i.e. by users lifting their bottom off the bed by pushing their feet down onto the mattress with bent knees. The height of some variable posture beds is also adjustable, either manually or electrically. Carers can raise these beds without needing to stoop and bend when assisting people to turn. These are mains powered hospital-type beds which will turn the user from side to side. Because of their size, they are not often used in a domestic situation. Most are controlled by the carer from a panel at the end of the bed or by foot controls. Some can be controlled independently by the person in bed, while others have an automated turning facility that carries out a turning cycle, for example every three to five minutes. These can be used on top of a domestic bed and take the form of either a sectioned mattress which has an airbag under each side of the mattress that alternately inflates and deflates, or a turning sheet which moves around two rollers on a frame on either side of the bed. Both styles have the effect of turning the person from side to side. They can be controlled using a handset, or can be set to turn at pre-programmed times automatically. It is advisable to use these units in conjunction with bed rails (cot sides), as they have no built-in side protection. These are made of a length of material which has either been stitched to form a continuous roller or is folded in a similar way so that the slippery material on the surfaces inside will easily slide against each other. The roller is placed across the bed and under the user who is lying flat on the bed with the open ends facing the head and feet. Once the roller is positioned some users find they can then turn independently. Alternatively, carers can assist the user by pulling on the top layer of the roller or by pulling on a correctly positioned handling sheet on top of the roller. Before using a product like this, carers need to know not only how to position themselves correctly but also a safe technique, as bad posture and poor technique during these types of manoeuvre can lead to back pain or injury. Two main sizes of roller are available: a small version (large cushion size) and a larger version (sleeping bag size). If the smaller, cushion sized roller is used, it is placed under the user’s shoulders and bottom. The larger, sleeping bag sized version is placed so that it extends from head to toe. When used for turning, the open ends of the rollers are always towards the head and foot end of the bed. Some rollers are padded and can, occasionally, be left in position under the person; others are very thin and are nearly always removed after use. If a roller is left in position it is important to ensure the person will not accidentally slip out of bed. High friction inserts are available to put in a roller to stop slipping. They are taken out when the roller is used again. Sometimes two flat sliding sheets are used, one on top of another, instead of a roller. The advantage of this is that carers can use the sheets not only to assist turning but also to move the person up the bed and across it. Sometimes the flat sliding sheets are used in conjunction with a flat board, which bridges any gap to help transfer the person from one lying surface to another. Some people find it difficult to get to the edge of the bed to swing their legs over the side. In order to move across the bed, a person must lift their bottom clear of the mattress surface. However, most people find their arms are not long enough to do this while in a seated position, particularly if they are well built, or the mattress is soft and allows their hands to sink down into it. A physiotherapist or occupational therapist may advise on a specific technique to use or, alternatively, the following equipment may help. 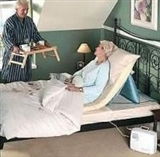 By profiling the bed into a sitting position, and by pulling on a strategically positioned grab rail or lifting pole, people may be able to take some of their body weight in order to raise themselves several centimetres from the bed, helping them to manoeuvre their bottom to the edge of the bed from where it may be easier to stand up. For further details on variable posture beds, grab rails and lifting poles, see section ‘For people who need help to sit up or lie down in bed’. If hand blocks are placed on either side of a person, they can, by pushing down on them, raise themselves several centimetres from the bed enabling them to change their position, e.g. move towards the edge of the bed. Ensure that the blocks have a firm base and the handgrips are comfortable to hold. The major difficulty encountered by some people when getting out of bed is standing up. Raising the height of the bed sometimes helps. It is possible to buy an extra high bed, or some beds have adjustable telescopic legs which enable the bed to be set at a specific height. However, in some cases it may be difficult to find a compromise between the optimum height for the carers who are helping with personal care or nursing activities, and a suitable height for the person so that he/she can sit on the edge of the bed with feet firmly on the floor. Height adjustable equipment may provide a solution. This is essential if one height is needed for getting out of bed and another for getting into it. Bed leg raisers are placed under the legs to raise the height of the bed. This can make standing easier. However, once raised, the height of the bed is set and the problems mentioned before may sometimes still be encountered. For example, although the raised height helps a person to stand it is too high for them to sit safely on the edge of the bed and/or to lift their legs into bed. Always ensure the bed is raised symmetrically, i.e. all the legs are raised equally. Raising one end of a domestic bed or not raising all its legs puts strain on the bed and it can collapse. Double beds can have four, six or eight legs. wheeled raisers - fitted with castors to allow the bed to be moved. These are placed underneath a standard domestic bed to convert it into an adjustable height bed. They have a powered mechanism controlled with a handset. This has either separate push button switches or a rocker switch. Elevating units require more space than the bed, as the scissor mechanism alters the position of the bed slightly as it elevates. Care should be taken that there is no wall-mounted obstruction to prevent the bed from moving vertically or that nothing can get trapped underneath as it is lowered. Adjustable height beds can be powered manually or electrically. Manually operated beds usually have a hydraulic mechanism that raises and lowers the bed. This movement may feel jerky as the bed rises. The control is often a foot pump at the side of the bed. It cannot be operated by the user. Some electric beds can be controlled by the occupant. This means he/she can select the most suitable height for getting in and getting out of the bed, sometimes with little or no assistance. They are usually controlled with a handset, which may either have two separate switches, or a rocker switch. Other controls are possible, such as remote control or voice activated. Although powered by a motor, most are quiet or almost silent. Care should be taken that there is no wall- mounted obstruction to prevent the bed from moving vertically or that nothing can get trapped underneath the bed when it is lowered. Many adjustable height beds do not stop automatically if there is an object underneath and there is a risk of entrapment. Height adjustable domestic and hospital variable posture beds are available. The domestic beds tend to be smaller with a wooden or padded headboard and are more suitable for the home environment. The hospital versions are usually larger with a metal frame and look more clinical. If a person is unable to take any of their weight through their legs, advice should ALWAYS be sought from a therapist as to the safest method of assisting or moving them out of bed. Most people are not strong enough to lift someone (including many children) from the bed onto a chair/wheelchair/commode. Equipment which will do the lifting instead is available or sometimes the person may be able to slide across. There are mobile or overhead hoists and slings designed to lift people. Mobile hoists lift efficiently but are quite difficult to move especially in confined spaces and across carpets. Overhead hoists lift well and have the advantage of making transferring easier. 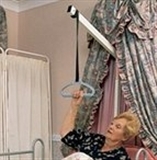 They have an overhead track which the person moves along sitting or lying in a sling. Sometimes small handling equipment is used to help people move in bed. Advice should be sought from a therapist on the safest handling technique and the equipment to use. Equipment such as hand blocks or lifting poles can enable some people to lift part of their own weight whilst the carer is assisting them to move. This reduces the possibility that carers will be subjected to strain and back injury. Items which raise the height of the bed, e.g. 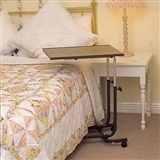 bed raisers, adjustable height beds, enable a carer to assist a person at a height which reduces the risk of back injury from bending over. Adjustable height beds (powered and manually operated) enable different carers to select different heights. Powered beds are easier to operate. Manually operated beds are controlled by a foot pedal or winding handle, which is situated on one or both sides of the bed. If the bed is positioned against the wall, ensure that the pedal or handle is on the accessible side. Both the pumping or winding action is quite hard work for the carer and the bed occupant can have quite a jerky ride. Wall-fixed or free-standing hoists have a vertical mast which is either attached to the wall or fitted into a stand. A boom from the mast reaches out over the bed and swings sideways through 90° to enable a transfer from a bed onto a chair or wheelchair. The hoist has a powered lift (mains or battery) but the swinging sideways movement is manually operated. A user must be capable of pushing against the bed or pulling on a grab handle to move sideways independently. Some of the hoisting mechanisms are portable and can be used on wall-fixed swinging frames in different locations, either for one person or for a number of different people. An overhead track hoist is sometimes the best solution in a domestic situation. If the layout of the house permits, it is possible to fix a track (straight, jointed or curved) so that the person can move him/herself (or is assisted to move) in a sling from the bed directly to another room in the house. 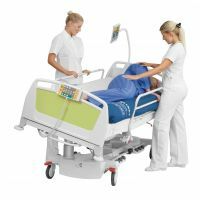 An electric traversing system enables the user or carer to control both horizontal and the vertical movements effortlessly. Some users can manage totally independently with the appropriate handset and slings. A manual traversing system requires the carer to push the person along the track in the sling. Care must be taken because the traversing mechanism may be noisy, especially if it is fitted in a flat where other residents are living above. Structural alterations may need to be made such as strengthening the ceiling or adapting the top of the door frame to take the track. 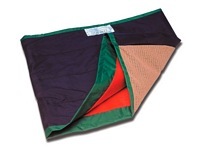 A wide range of slings is available to meet the needs of the user. A small mobile hoist can be used for many handling tasks in and around the home. With the wide range of slings available, it can cater for many different needs and abilities. Remember, mobile hoists are designed as lifting and transferring aids not for transporting. If the person needs to be moved from one place to another, an overhead track hoist or specifically designed wheeled equipment should be used, as this reduces the risk of injury to the carer. will the furniture need rearranging to make sufficient space to manoeuvre the hoist? if the height of the bed has been raised (e.g. by adding an extra mattress for pressure relief) can the hoist still lift the person so that his/her bottom clears the mattress surface? if the person falls, will the hoist reach down far enough to lift him/her from the floor? where will the hoist be stored when not in use? These are smooth surfaced boards, tapered at either end to assist sideways transfers. They can be used independently or with help to slide in a sitting position from the chair onto a wheelchair. It is easiest if the mattress surface and the seat height are at the same level. Curved transfer boards are useful when transferring onto chairs with fixed armrests, as they make it possible to transfer around them. Some boards have additional transfer systems incorporated. One board has a transfer disc which moves within a central slot; another has an integral roller which the person sits on and slides across the board. Similar transfers can be made using a low friction roller and a rigid, padded bridging device. These are made up of two circular discs that rotate against one another. 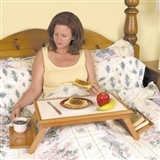 They are useful for someone who can semi-stand or who can use a board as a bridge (but finds it difficult to turn, step or adjust his/her feet) to transfer directly from bed to chair. Users place their feet on the disc and, as the transfer is made, the disc swivels. A handling belt worn by the person can make it easier for a carer to help guide him/her around in a semi-standing position or across the board. It is difficult to support someone on a turning disc. If support is needed ask for an occupational therapist or physiotherapist to assess the situation. One possible solution is a turning disc with a frame which the person can hold onto. Many of the solid discs use ball bearings in the swivel mechanism, which may result in fast turning that can be difficult to control. However, this may be useful when a heavier person is moving, as their weight sometimes prohibits discs without ball bearings from turning on one another. Some discs are made of two flexible fabric discs with a slip-resistant outer surface for standing on, and a slippery inner surface. 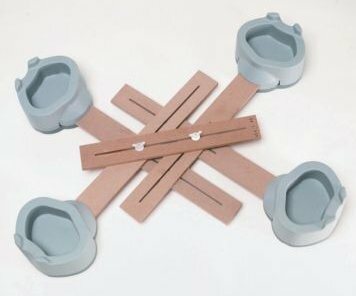 These can be used to move the feet in the same way as the solid discs, and can also be placed under the bottom of a person to help him/her swivel round. Because they fold up, they are easier to carry around than the solid discs. Handling belts are usually made from webbing and are adjusted to fit around the waist. They usually have vertical and/or horizontal handholds to provide the carer with a firm and comfortable grip. Handling belts are used to help guide the person whilst he/she is standing up or sliding across a board and to help give the person more confidence. It is unsafe practice to use them as lifting belts - i.e. when a carer pulls on a handling belt to take most or all of a person’s weight to help him/her to stand. 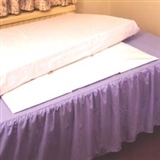 These narrow drawsheets are laid across the middle of the bed to reduce the risk of soiling the bed clothes. They are long enough to be tucked in on either side of the bed. These pads, which are laid on the top of bedclothes, are designed to absorb urine. Choosing the right bed so that the spine is properly supported can help to relieve back pain. BackCare and the National Bed Federation produce a range of factsheets on buying a bed, with information on the different types of mattresses that are commonly available. As a short-term solution, if the person's bed is too soft or sagging, a bed board can be placed under a mattress to make it firmer. However, this will only work if the bed base is soft or sprung, i.e. if the base is already solid it will not make any difference. If a mattress has become too soft to lie on comfortably, it is usually better to buy a new mattress. It is advisable to seek advice from a physiotherapist before using a bed board. Most manufacturers of domestic beds make firm mattresses, which are often called orthopaedic although there is no national standard controlling the criteria. The user should always try out the mattress before buying it because what is comfortable for one person may be very uncomfortable for another. It is advisable to visit a showroom with a range of beds and mattresses. Do not be afraid to lie on each bed and test it for as long as you can. Companies who offer to make you an orthopaedic bed designed to suit your particular needs should be approached with caution. It may be a complete success, but remember that, because it is a one-off, you cannot try it out first. Companies have been known to claim, even if the bed is not comfortable, that it has been made specifically for you and that they cannot sell it to someone else. Remember we spend at least one third of our lives in bed - this is a lot of time to suffer an uncomfortable bed. These are designed to support the bedclothes at the foot end of the bed, so that a person can turn over more easily in bed and their legs and feet are protected if the weight of the bedclothes is causing undue pain or pressure. However, their presence may cause cold legs and feet. Part of the frame runs between the mattress and the bed base so that the frame remains stable. Bed grab handles are designed to aid a person getting in and out of bed and moving around whilst in bed. It is unsafe to use them as bed rails. Bed rails (cotsides) are designed to help prevent a person from rolling out of bed accidentally. It is essential that bed rails are suitable for the person who is using them and compatible with the particular beds being used. Most bed rails for domestic beds have bars which run across and between the bed and the mattress for greater security. Serious injuries have occurred from the use of bed rails. The prescribing, selecting, fitting and maintenance of bed rails needs considerable care to avoid injury. The Medical Devices Agency (now within the Medicines and Healthcare Products Regulatory Agency (MHRA) - see Useful Organisations) issued a bulletin in July 2001 - Advice on the safe use of bed rails. body positioning devices (these help to position a person with specific clinical needs, e.g. someone who has contractures). take care if a mattress overlay is used or the mattress is changed. If the bed rail is too low (because of the extra height of the overlay) the occupant can fall over the top; softer surfaces can increase the risk of entrapment between mattress edge and rail; some mattresses are too light to hold the bed rail in place and there is the risk that the rail, mattress and occupant might fall. Check whether manufacturers and suppliers can provide secure fastenings and extra height bed rails. Standard rails have safety catches on the outside. These can prevent an otherwise independent person from getting out of bed and going to the toilet. However, a unique model is available which serves as a safety rail, can be used independently and also helps raise the person’s legs. An air filled platform first moves through 90° to bring the platform to the horizontal, lifting his/her legs. The user then moves the legs across into bed. The platform can be raised a further 90° to form a barrier to prevent him/her falling out of bed. Pressing a button on the handset will deflate the platform to allow the user to get out of bed. One solution considered to prevent accidental falls or to deter wandering is for the person to sleep on a mattress on the floor. It is very difficult to care for a person at this level. The risks from moving and handling and the loss of independence need to be balanced against the perceived benefits. Movement monitors are available which alert a carer that a person is getting out of bed. They have a pressure sensitive plate, which is placed under the mattress and will set off an alarm when the person gets out of bed. Floor-standing bookrests are available for people who are lying flat and are therefore unable to hold a book. The height of a vertical stand adjusts telescopically and a horizontal arm swivels towards and away from the user. 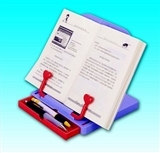 The book can be placed face downwards and can be angled to a convenient position for the user. On some models the book has to be removed each time the page needs turning. It may be possible to do this independently, although some people will require help. A powered fully automated device controlled by switches is available which both holds the book in a downwards-facing position and turns the pages. These enable a person who is lying flat or is unable to bend their neck, to read or watch television. They can be worn over normal glasses. For people who display no danger signs such as reddening of the skin, a mattress that provides comfort alone may be all that is needed. This may be quite sufficient although it should be checked every four to six months to make sure that the foam has not deteriorated. Silicone fibre mattresses, made from hollow cored siliconised polyester fibre, feel rather like a thick duvet. 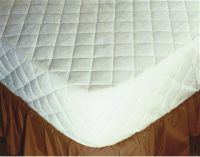 Flame retardant and washable, they can be used as a comfort mattress or for people at low risk from pressure ulcers. The resilience and softness of the mattresses may vary. Sheepskins do not relieve pressure but can be helpful when used in conjunction with other pressure relieving support systems because wool fibres are naturally resilient and so help to reduce shear forces. They also help to maintain low humidity and temperature by absorbing water vapour and heat. Sheepskins come in three main forms. This wool fleece on its own leather backing is the most comfortable and reduces shear forces most efficiently. However, great care must be taken when washing, and the fleece must be regularly brushed so that the fibres do not become matted. These skins are less resilient than the natural sheepskin and therefore do not reduce shear forces as efficiently. Also, they do not absorb heat and moisture so readily. However, they can be washed more easily and effectively. Because it has been removed from its natural backing, the pile on this sheepskin tends to be shorter than on a natural sheepskin and is therefore slightly less resilient. However, this type of skin is easier to wash, although it still needs regular brushing to prevent matting. The beanbag on the underside of the tray moulds to the shape of the lap to provide a more stable surface than a traditional tray. The trays are available with raised edges, recesses for plates and cups and slip-resistant tray mats. They come in a choice of designs and some have detachable beanbag bases for washing. These are high-rimmed trays with two legs and a slip-resistant tray mat. They are designed to be stabilised by the legs, the width of which can be adjusted to fit snugly on either side of the person's thighs. The legs fold flat when not in use. These are much smaller than bed tables, and are less sturdy. The cantilever tabletop is supported on one side only so that the table can be positioned close to the bed. Those without castors have a shallower base and may fit under a bed with only limited space underneath, although they are more difficult to manoeuvre into position. Some have the option of a tilting top for supporting a book, newspaper, or writing paper at an angle. These are like hospital bed tables. They span the width of the bed with the legs resting on the floor on either side. They all have a tubular metal frame supporting a tabletop. A wide range of book stands are available. Most are designed to hold books, although a few are large enough for magazines and newspapers. Some are floor standing and their height and angle can be adjusted; others are designed to rest on a table. These are useful for people who are unable to turn the pages of a book. Two types of turner are available - a simple stick with a rubber tip used in the hands or mouth, or a powered fully automated device controlled by switches which both holds the book and turns the pages. These can be draped across the bed and provide storage pockets in which to keep bits and pieces, such as books, knitting, TV controls. This provides a method of securing items such as mirrors and cups in a convenient position.